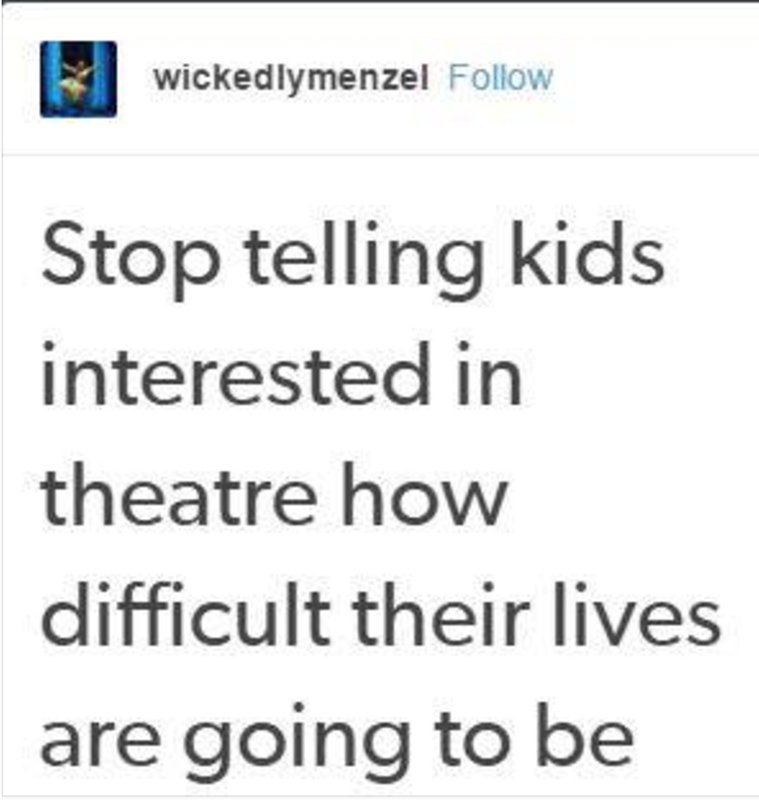 I was one of those kids in theatre. I am now currently a young adult studying theatre. Over 10 years I've been working with, in, and around the theatre and every year someone has decided to tell me how "difficult my life is going to be". I'm always surprised they feel the need to share their unwarranted opinion, but mostly I'm amazed at how they can be disappointed about a choice that was not theirs to make. I think the collective attitude is that anyone who chooses to pursue a career in a creative arts field is not thinking realistically and that they're young and naive and "sooner or later they'll understand that following their passions was the wrong decision." Quite frankly, I think that's a very misguided and uninformed way to look at things. A life and career within the theatre or any creative art is definitely not the easiest industry to break into but it doesn't mean that it's impossible or the wrong choice. What it does mean is that anyone who chooses to do so, has to dedicate themselves to pursuing that goal. It means that they have to work hard, network hard, and learn to live within their means. It's time to start encouraging people to get involved and pursue theatre. Not everyone who's interested in theatre suddenly wants to be the next big actor or director and make it big. A lot of my friends decided to study theatre to become Drama Therapists, Teachers, Producers, the list goes on. Theatre opens up doors to so many other professions and teaches us a whole range of transferrable skills. It's also incredibly disheartening for anyone to hear that what they want to pursue is suddenly the wrong choice. Moreover, why would you stop encouraging someone to do something that they like? An interest and involvement in theatre teaches people how to expresses themselves, interact with a huge range of people, and most importantly, to always say yes. So much more can be said about what theatre offers but I want to leave this on the point of saying yes. Theatre teaches you to be prepared for the unexpected. The first thing many people learn in a drama class is to say yes and never say no. We're taught to take what life gives us and make something out of it. So no matter how "difficult" our life might seem on the outside, we're always ready to take on the next challenge and say yes. Thank you! Be sure to confirm your subscription via email! Newer PostI Love Selfies, So What?